Quality Highest. Super HD uses a sampling rate of 192kHz and bit depth of 24bit. This is the closest you can get to experience the subtleties, dynamic range and purity of sound that you hear in live concert recording. You’ll feel like you’re sitting the right in the front row. ALAC (Apple Lossless Audio Codec, suffix .m4a) files are optimised for latest generation Apple OS. These lossless files are up to 40% smaller in size than the original WAV masters, without sacrificing audio quality. They are supported by iTunes without the need for conversion. FLAC (Free Lossless Audio Codec, suffix .flac) files optimised for latest generation Window OS. These lossless files are up to 40% smaller in size than the original WAV masters, without sacrificing audio quality. FLAC files are widely supported (though not currently by iTunes) and can be played in a number of freely-available media players on Mac of PC. Quality Highest. Super HD uses a sampling rate and bit depth 3x higher than CD and 15x higher than MP3 for encoding mastered audio. 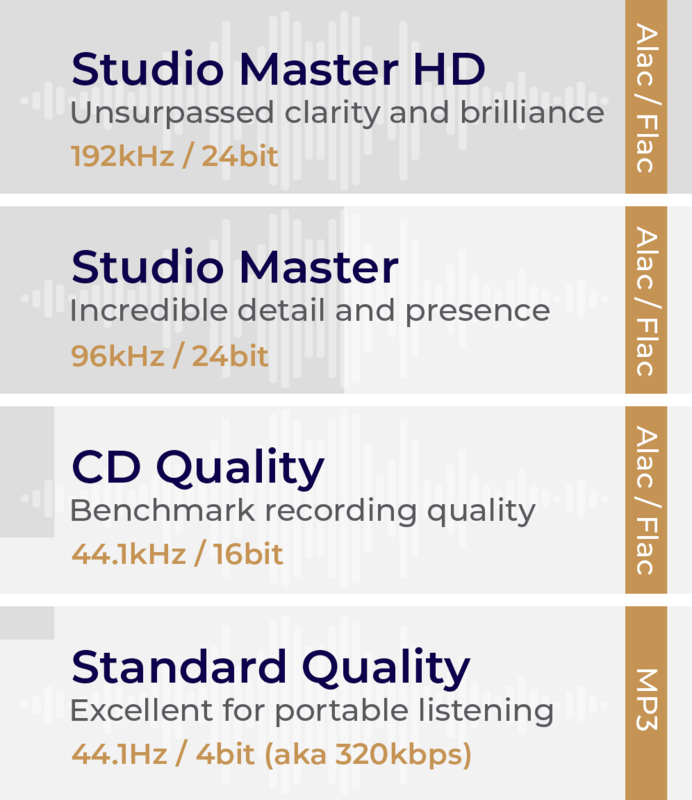 Listening to 24bit, 96K is the closest you can get to experience the subtleties, dynamic range and purity of sound that you hear in live concert recording. You’ll feel like you’re sitting the right in the front row. Formats ALAC optimised for latest generation Apple & Windows OS. For high quality legacy audio ask us for WAVs – see below. Quality At least 5x higher bit rate and depth than MP3 and streaming. Listening to choral and chamber music on CD resolution you’ll discover details and closeness to the sound that are lost in MP3 or streaming audio. CD audio format gives you quality and convenience. Formats ALAC optimised for latest generation Apple & Windows OS. For high quality legacy audio see below. Quality Balance of quality and portability. Convivium encodes MP3 direct from high resolution masters at 320kbps, the top end of MP3 quality. When masters are compressed into MP3 a lot of the details artists and engineers work hard to capture is lost resulting in softer bass vocals, thin top range soprano and flattening of timbral instruments particularly organ and chamber music. We recommend MP3 only when small file size is the priority. Format MP3 optimised for latest generation Apple & Windows portable players. Higher resolution ALACS also support most portable players. We get that everyone’s favourite audio setup is different and we’re here to help take the stress out of converting audio formats or ripping CDs. We offer studio mastered FLAC and WAV formats on a by request pro forma invoice basis. Pricing is consistent with our Super HD Alac products. Email us at info@conviviumrecords.co.uk with your details and audio you wish to audio and we’ll get back to you in 48 hours.